The European Union starts 2015 with new leadership in place, ready to confront a threshold year where key international deals need to be struck at four major summits on financing for development, sustainable development goals, climate change and trade for development, write James Mackie and Rhys Williams. James Mackie is the Senior Advisor in EU Development Policy, and Rhys Williams is Communications Officer for the European Centre for Development Policy Management. We have been here before, and agreement has been sought in these spheres separately – but all the global agreements reached this year are mutually reinforcing and are all needed to achieve a transformative agenda – there can be no weak links in the chain. If they are all concluded in the right way, the impact on global development would be far-reaching, setting the scene for international cooperation for years to come. The European Year for Development coincides with the culmination of the post-2015 debate, but not by accident. The EU’s new Commission team, led by Jean-Claude Juncker, must get off to a running start. They should stimulate new ideas, champion key issues and have an open debate on how ‘universal’ the new global development goals should be – for both developing and developed countries here in Europe. Juncker has moved swiftly to introduce new, and potentially more coherent and flexible approaches to management, an encouraging start. Major global changes are afoot and the EU will be called upon to prove its relevance and effectiveness to its own citizens, to its neighbours and to the world. Strategic choices made this year will have major impact on Europe and its neighbouring continents – not least Africa. What are the challenges that lie ahead in 2015? In 2014, more than 207,000 people – increasingly Syrian and Eritrean asylum seekers – have made the perilous crossing across the Mediterranean, with over 3,400 migrants losing their lives. Since the new year, ‘Ghost Ships’ have arrived on the shores of Italy, gangs finding shocking ways of making sure migrants arrive in the EU, forcing authorities to react in an ad hoc way as official rescue operations in the Mediterranean by European naval forces have ended. To better govern migration for the future economic benefit of both Europe and Africa, and to ease the current crisis of migrant deaths in the Mediterranean, Jean-Claude Juncker’s new Commission team must show innovation and leadership and encourage effective synergies in the way the EU works across all its policy areas. If migration is managed well, it can be a very useful tool for development in both Europe and Africa. Europe needs to become more serious about cooperative and comprehensive action to address its many collective challenges. Europe’s partnership and cooperation with African leaders and the African Union is key to realising tangible progress. 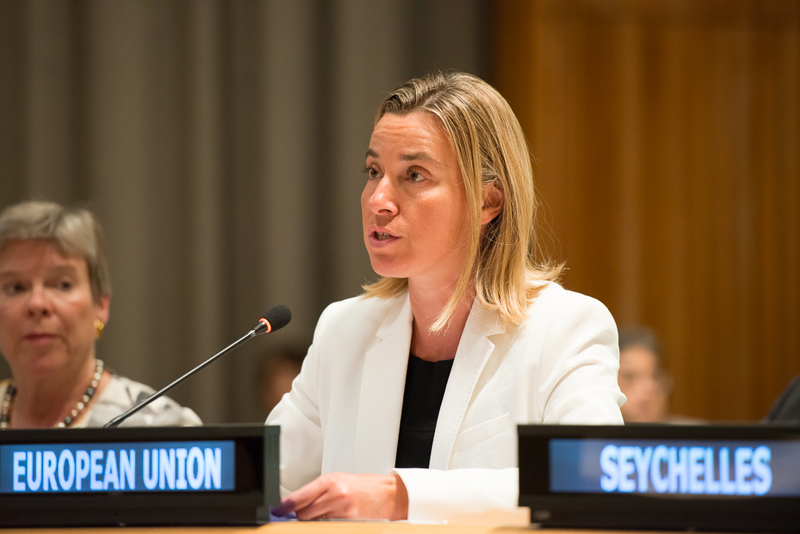 Federica Mogherini, the EU’s new High Representative of the Union for Foreign Affairs and Security Policy, will spend much of her first year addressing the most volatile situations. This array of crises may prompt calls for a review of the European Security Strategy (ESS). That strategy was formulated in the aftermath of 9/11, when the focus was mainly on terrorism, proliferation of weapons of mass destruction, state failures and regional conflicts, most at some distance from Europe. The crises are now more complex and closer to Europe. If an ESS review takes place, it should consider a more comprehensive approach, ensuring a two-way link between development and security. There can be no security without development, just as there can be no development without security. Reviewing the ESS at a time when European sentiment is on the wane risks it being watered down. Much, therefore, will depend on whether the new EU leadership succeeds in restoring a measure of confidence and dynamism to the European project. With crises in the Ukraine, Iraq, Syria, the Sahel, Libya and the South China Sea the biggest challenge for the international community will be to work together effectively on these and many other challenges. The strong-armed approaches that result from these conflicts may mean that the individual concerns and allegiances of powerful states will dominate the agenda of the UN, drawing political energy away from global development and towards crisis management. Crises tend to push countries apart, making agreements in global policy processes more difficult to reach. At the same time, the Ebola crisis effectively pulls in the other direction. The common effort to combat the disease has helped foster some global unity which should ideally be built on. The rapid spread of the epidemic also underscores global interdependencies and vulnerabilities and points to the continuing need for a rigorous, comprehensive and sustainable global development framework focused on lifting as many countries as possible out of the limbo of fragility, which in many ways enabled the disease to spread out of control in the first place. Will the forces of conflict or unity prevail? The continued economic depression in the Eurozone has forced an existential crisis in Europe. 2015 will be a pivotal year for the EU to step forward and demonstrate to the world it is a partner that can strengthen respective positions as a global players in international cooperation. Now, more than ever, Europe’s problems need global solutions and global problems need European action.